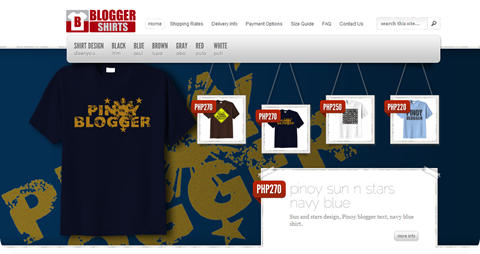 While doing my daily blog hoping, I saw Brod Fitz post about his new venture, selling T Shirts Online targeting Pinoy Bloggers. T Shirts have cool design. I know Fitz ever since we’ve met at iblog, and I could say that he do what he says. There were times that I even ask him to get my award at Digital Filipino Web Awards. Currently they are only accepting orders that can be delivered in the Philippines. I cannot get one since I am in Saudi Arabia. But for sure before my next vacation on April 2012 , I will have to contact Fitz for my family Pinoy blogging shirt. Here is the link : BloggerShirt.com . If you are in Philippines, I think Php 270 + Delivery charge, is just a little amount compared to the blogging money that a blogger is receiving every month. Congrats Fitz and Buhay Bohemio . Hehehe looking forward to have this shirt as well. Pede ba walk-in sa store? hehehe para maka pili ng tamang size. Ano po pala ang return policy? if ever di kasya ang shirt? Woot! Thanks Dex for blogging about Blogger Shirts! Welcome Fitz.. sana lang yung shipping di mas mahal sa shirt ha ha ha ..